1 of 4 Line a plate with paper towels. 2 of 4 Place garlic and 1/2 cup of the olive oil in a small saucepan and bring to a simmer over medium-high heat. Reduce heat to medium-low and cook until garlic is lightly browned and crispy, 5 to 8 minutes, taking care not to burn it. Transfer garlic with a fork or slotted spoon to prepared plate; set aside to drain. 3 of 4 Heat remaining 2 tbsp olive oil in a large saute pan over medium-high heat. Add spinach and cook, stirring continually, until wilted and warm, 2 to 4 minutes. Season with salt and pepper to taste. 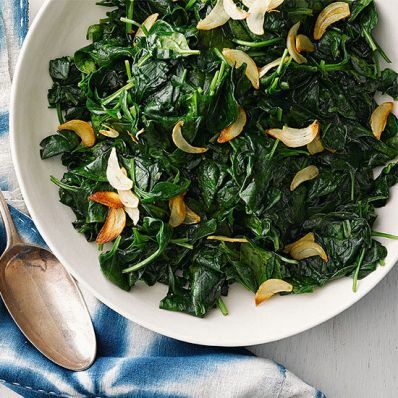 4 of 4 Transfer spinach to a serving plate and garnish with crispy garlic chips.